Novomatic have released yet another Asian-themed gem of a slot game. This time it’s called Royal Lotus and it’s royally fun to play! The five reels stand in front of a beautifully landscaped garden. It must be early morning because there’s a mist and a lovely, pinkish orange light illuminating the garden. 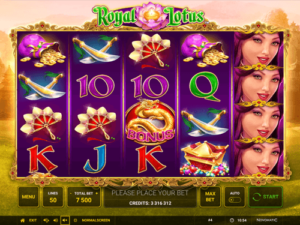 Royal Lotus has 50 paylines that run from left to right across the reels. The minimum bet is 0.50 as the minimum bet per line is 0.01. When you play Royal Lotus, you must play with all 50 paylines active. This gives you the biggest chance to win! Like true Royalty, this slot game is dripping with wealth. The reels are decorated with gold and rubies. All of the symbols look like they’ve come straight from the treasury! There’s so much gold and so many jewels and gemstones that your eyes will be dazzled. In Royal Lotus, you can win Free Games which are played with extra Wilds. The main character in Royal Lotus is a stunning Asian beauty who’s probably a member of the royal family. She can be stacked in the game and when you fill all five reels with her pretty face, you’ll get an extra special (extra big) win! As usual, you can use the gamble and autoplay features which are available in this Novomatic slot game. Other Asian-themed slot games from Novomatic are also popular! Some of the most well-liked ones are: Asian Attraction, Katana, Asian Diamonds, Dragon’s Pearl and Dancing Dragon. To start off with, all of the royal card symbols are on this slot. There’s the Ace, the King, the Queen and the Jack, as well as the 10 and the 9. In comparison with the picture symbols, these card symbols give out lower payouts. You can see the potential payouts for every symbol on the paytable. The picture symbols are very royal indeed. There’s a royal fan, two ceremonial swords, a pouch of golden coins, a treasure chest of gems and the beautiful, royal lady. For the Royal Lotus payouts, you’ll want to be lucky enough to spin the reels and land 3, 4 or 5 of a kind across a payline. For the paylines to award the 3, 4 or 5 symbol wins, they must follow a payline on consecutive reels, starting from the far-left reel. How much you win for combinations of matching symbols will depend on your bet. If at any time you want to clarify the win amounts, open the paytable. This shows the win payout for 3, 4 and 5 of every symbol, and the values will correspond to your current bet. When the symbols land in lucky positions and award you a payout, you can collect the win or gamble it. When you have the ‘auto’ on, your wins will be automatically collected, unless you turn auto off. When you gamble a win, you stand the chance of doubling your win or losing your win. With every successful gamble, you get another go! When you have an unsuccessful gamble, you’ll lose your win and go back to the game. The RTP for Royal Lotus is high but that’s not the only reason why players are fond of this game. In Royal Lotus, you can win Free Spins which see added Wild symbols on the reels! In the normal game, there’s a Wild symbol which is a pink lotus flower cradling a candle. The lotus Wild is able to substitute for all other symbols but not for the Bonus symbol. The Bonus symbol is a golden Chinese dragon on a bright red background. 3 Bonus symbols gives a small win (4x your bet) plus 10 Free Games! The Free Games are great to start with and they get even better with every spin. That’s because, for every spin, 4 extra Wilds are added to the reels – one on each of the reels 2, 3, 4 and 5. That’s 4 more Wild symbols with every spin! How do you like them lotuses? It’s possible to get additional Free Games by spinning another 3 Bonus symbols in a Free Spin. However, you’ll only be able to do this once and you’ll only be awarded another 5 Free Games, instead of another 10. So that’s a total of 15 at a time.